Life Size Deluxe Animated CAULDRON CREEPER Talking Creepy Zombie Ghoul Evil Demon Character Horror Prop has a soft PVC head with a moving mouth and light-up eyes, a tattered costume with gauze details and blow-molded plastic hands. The Cauldron Creeper! Wearing a tattered costume with long shredded-gauze accents, this disgusting 72-inch (6 -Ft or 180cm) tall animated Cauldron Creeper loves stirring his stew - and wants to have you for dinner! Featuring PVC head with hinged jaw, hands and chest with such realistic sculpted details you have to see to believe he's not real - truely disgusting! Plug the UL power adapter into any standard outlet and choose from Steady-On or Infra-Red Sensor or Step Here Pad (included) activation options to operate. "Ah, this is thickening nicely, yessss. Heh heh, this cauldron is full of tasty morsels I have found. Would you like to give it a try? It's Halloween ANYTHING can happen this night! Heh Hah!" 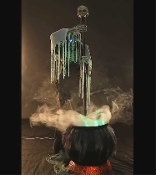 Attach the optional Fog Hose (included) to your *Fog Machine (*NOT included) to add fog coming out of the cauldron to complete the creepy effect. The infra-red sensor works up to 6.5' feet away and works in all lighting conditions - bright light to no light! Item includes volume control. Easy-to-assemble quick-connect poles. Assembly required.